Eat, drink and be eco-friendly at our annual sell-out event and the biggest oyster party on the West Coast!Featuring 30+ varieties of local oysters shucked to order at our 150-foot oyster bar, a fresh seafood buffet, live music and more. To complement our fresh fare, we have gathered a select group of microbrews and featuring over 75 wineries—with a special collection of producers that follow sustainable growing practices. Our commitment to sustainable practices is core to everything we do. We reuse or recycle everything possible from the event, and compost all shells and food waste in partnership with Cedar Grove. 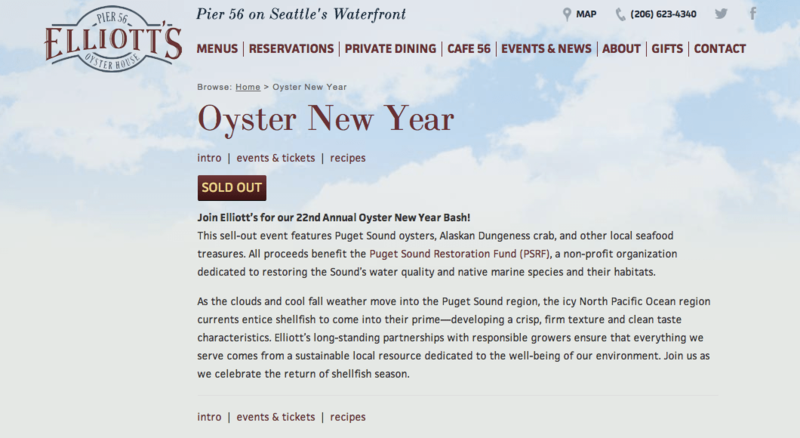 And as always, all proceeds from Oyster New Year benefit the Puget Sound Restoration Fund (PSRF). As part of Elliott’s partnership with PSRF, we actively participate in their Henderson Inlet Project. At least twice a year, our staff volunteers help seed, tend and harvest the oyster beds on Henderson Inlet’s Community Shellfish Farm. To learn more about PSRF and to support their efforts directly, visit their donor page.